Family, Friends, Food, & Fun...What life is all about!!! Look no further, you have found the pros! SUMMER SATURDAYS book up fast!!! It's time to put your date(s) in for your FUTUREevents....email us. Decide menu and other details later....reserve your date NOW! NOW ACCEPTING BOOKINGS AT THE HIGH GATE CARRIAGE HOUSE!!! Professional outdoor catering at YOUR specific location...within Morgantown, WV and surrounding areas (we cater up to 1.5 hrs from 26508). Home Style BBQ with On-site grilling and pig roasting. Wedding and general catering services available. Let our professional Chef and owners, Dana & Ronnell Gibson take care of your event needs! We can handle as little or as much of your event as you would like. Great Food! Great Quality! Great Service! Great Prices! 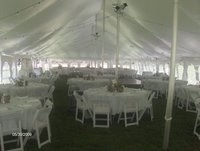 Company picnics, holidays, grad parties, family reunions, showers, receptions, birthday parties, retirement parties, funeral food services, party trays, tailgates, poker runs, fund raisers, grand openings, employee appreciation luncheons and more! Please note: The best way to contact us by emailing us. Please email us with your contact info, event location, event date, approximate guest count, and a tentative menu. We will then type up an estimate an email it back to you. Changes on menu and guest count are welcome to be made up to one week before your event. Email or call Dana @ 304-598-8885 to reserve your date(s)!